Used an old Quantaray 9500, at 1/16 triggered manually (test), while hand holding above and to the right of the subject, giving a nice side lit look to the scene... Hand held shot with S95 @ 1/5 sec, aperture was set at f/4.5 to keep flash from blowing everything out. Honestly, I think I need a flash that can be used as a slave, because manually triggering them is a bit of a trick. AHA! So this is what started your thirst! I actually find using a flash with my P&S very rewarding and fun, and do it pretty often, actually. 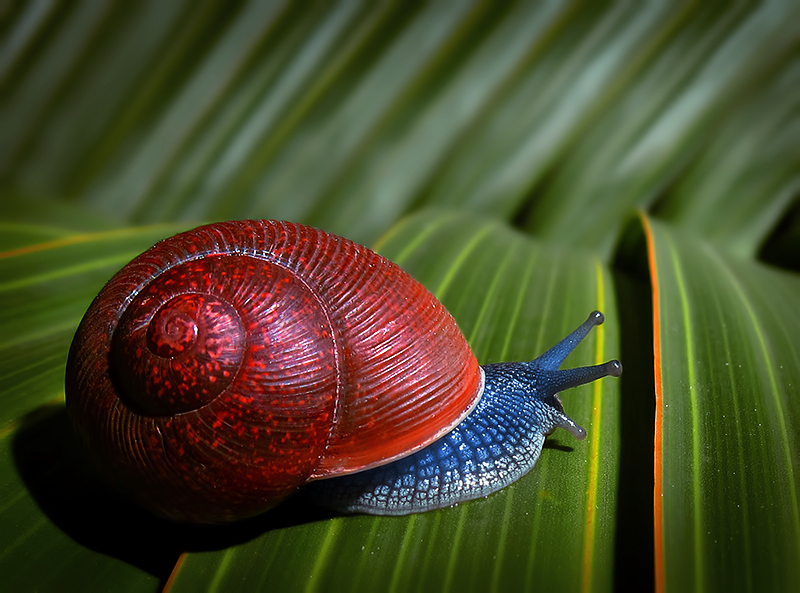 Great shot though- love the colors of the snail in particular, and the angling of the light works great for accentuating the swirl of the shell. Grats on the great finish, Cory. You need to go back and give this little guy something for his time and trouble to pose for you;-);-) You did a bang up job with the lighting and focus - the textures/details on the snail and the leave are fabulous. The red, blue and green colors are bold and rich in tone that they just pop off the page. Great image Cory, one of my higher score for the challenge! Dude! Great image. Great finish! Damn, you just missed the top 10 on a Free Study. First place on page two, I guess. Nice shot and finish. Proudly hosted by Sargasso Networks. Current Server Time: 04/22/2019 02:56:20 AM EDT.